Professor James Hannon and doctoral student Annie Machamer talk about some of the research they have done around physical activity and academic performance over the last year. An increasing body of research is showing that students who have time for physical activity in their school day tend to perform better on tests and have an easier time concentrating. Hannon has overseen several studies in the last couple years around physical activity and academic performance. In one study, his group had students take a mathematics test after 20 minutes of vigorous physical activity. Meanwhile another group of classmates watched a 20- minute video on women’s soccer. “And they performed significantly better after engaging in the aerobic exercise – it was anywhere from 11-22 percent improvement on the math test actual test score – after engaging in the aerobic exercise,” he said. Doctoral students Annie Machamer and Hannah Kipfer demonstrate some activities students might do during the course of a school day. The Centers for Disease Control and Prevention recommends that children participate in at least an hour of physical activity daily. According to a 2013 study, only a quarter of US students reported actually achieving that goal. But in order to incorporate physical activity into the school day in a more comprehensive way, schools need policies that support those initiatives. In 2014, West Virginia passed a bill that said, among other things, West Virginia elementary school students were required to have at least 30 minutes of physical education three days a week and 30 minutes of recess daily. “So what that means is it challenges administrators – it challenges classroom teachers, staff – to be more cognizant of how important physical activity is throughout the school day,” said Emily Jones, a colleague of Hannon’s at WVU. 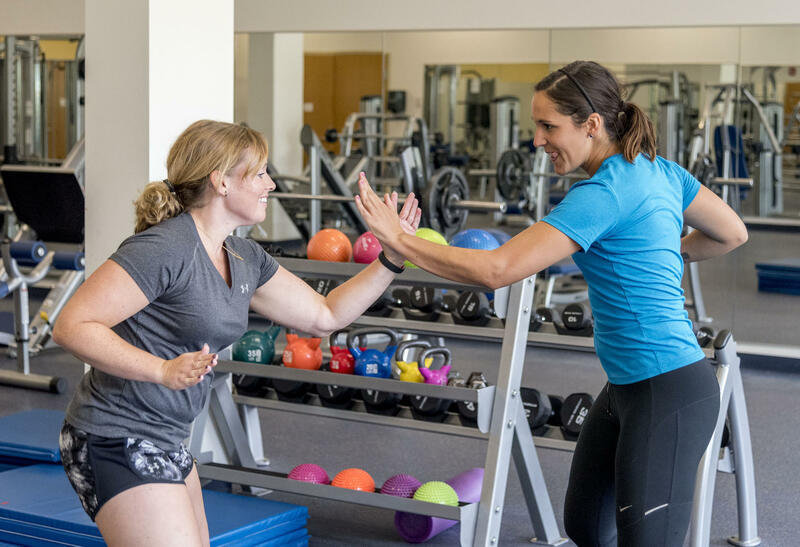 Doctoral students Hannah Kipfer and Annie Machamer said teachers can incorporate more physical activity into their day in two easy ways. First, take a brain break, which is basically just a minute or two when kids can get up and move through silly activities, like doing jumping jacks while reciting the alphabet. The next is by actually incorporating physical activity into lessons. For instance, learning the mean, median and mode by doing pushups and counting the results. The kids love it, but for teachers it isn’t always as easy. “And some of the barriers were accessibility of time. That’s a big thing we see... scheduling throughout the school day – they have to change their lesson plan essentially, and that takes time out of their school day,” said Machamer. Machamer said even though there were some barriers to incorporating what they called “active lessons” into classes, participating teachers did report their students were able to concentrate more at the end. Researchers are now looking to find out which types of exercise are most effective at improving academic performance. In the meantime, simply incorporating some kind, any kind of, physical activity into the school day seems to help. In the first part of 2015, the percentage of uninsured Americans dropped almost 12 percent due to the Affordable Care Act, but even though more Americans are insured than ever before, deductibles – the amount of money you have to pay before insurance kicks in – have skyrocketed, going up by almost 70 percent since 2010.